Menswear startup Thread has raised £16.7 million ($AU31 million) to help men navigate clothes shopping. Thread uses a mix of machine learning and real-life stylists to learn about its customers’ fashion tastes, and recommend stylish clothing accordingly. The company has well-known brands such as Hugo Boss and Barbour on board, and more than 1 million customers. The company will use the money to cement itself as a household name and build up its technical capabilities. 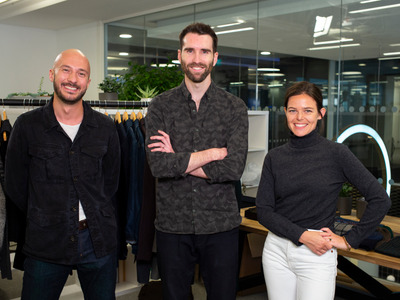 Thread, the startup that helps men who hate shopping buy clothes, has raised $US22 million (£16.7 million) in venture capital backing to expand its technical capabilities and to cement itself as a household name. Thread has more than a million customers signed up to its service, which takes a few registration details about a user’s fashion taste and budget, then uses that information to recommend new outfits. As customers buy more clothing through the app, Thread’s algorithm learns more about what they like and makes new recommendations accordingly. It also learns from clothes customers click on but don’t buy, what they scroll past, and what the weather’s like. The idea is that men who hate rifling through racks of clothes in physical stores can still look smart and on-trend by buying through Thread. Well-known brands such as Barbour and Hugo Boss are available through the service. The startup employs 10 full-time stylists who curate outfits and write personalised messages to customers. But much of the recommendation load is handled by Thread’s homegrown machine learning algorithm, much like Spotify’s algorithm recommends music. Chief executive and serial entrepreneur Kieran O’Niell said a quarter of Thread’s users buy all their clothing through the service. It’s currently only available to male shoppers in the UK, but O’Niell said the plan was to introduce womenswear to the app some time in the future. Thread’s latest round was led by new investors Balderton, Forward Partners, Beringea and H&M’s investment arm. The round included a small amount of debt financing from Triplepoint Capital. High-profile previous investors include DeepMind cofounders Demis Hassabis and Mustafa Suleyman, and prestigious Silicon Valley bootcamp Y Combinator. O’Neill also plans to follow a startup trend set by the likes of Monzo and BrewDog: letting customers buy in. The company will open up to crowd investors via Crowdcube in November. The plan is to raise £500,000 to £1 million, though O’Neill said Thread may cap the round.